Working Dates: As a photographer in Cambridge from 1859-1863? Subjects, styles, advertising, other relevant information: Edward Gage was a hatter, print and picture frame seller, dealer in musical instruments and fancy goods and a licensed tobacconist in Sussex Street Cambridge from around Sept 1855 to March 1857. Then, from around March 1857 to September 1861 he was at 44 Sidney Street carrying on business as a hatter, dealer in prints, picture frames and musical instruments and fancy general goods and, from Sept 1859 to Sept 1861, also carried on the business of photographic artist and dealer in stereoscopes and slides. Also during 1856 and 1857 he let out a room in Hobson Street Cambridge for public and private parties and hired out flags and banners for decoration at events. Gage advertised in the Cambridge Chronicle 4th September 1858 "Correct Likenesses at reasonable prices at Edward Gage's Sidney Street, Cambridge, weather no impediment to first-rate portraits." The reasonableness of his prices was obviously a strong selling point illustrated in the Cambridge Chronicle of 29th October 1859 in a report of a case brought in the Cambridge Borough Court of Pleas. The case was brought by another photographer, Edward Monson, against an undergraduate, Mr Eardley Gideon Culling Eardley, of Trinity College, for non-payment for various portraits and other photographs he had purchased, totaling £3.16.0. Part of the case revolved around whether the photographer Monson had sold "necessities" or extravagant items to the rich, but irresponsible, undergraduate. The undergraduate's portrait by Monson cost 30 shillings. During the case, the defendant's lawyer argued "If the defendant wanted a likeness, he might have gone to Gage's for 1s 6d." In the 1861 Census, Edward was shown as a print seller etc at 44 Sidney Street living with his wife Martha b:1843 Cambridgeshire. In 1871 his employment was shown as "decorator" and he was living at 32 Bullen Place. Edward Gage filed for bankruptcy at the County Court in Cambridge in 1861. The Cambridge Independent Press of 28th September 1861 recorded his first hearing, with debts £292.16.6 and assets £78.9.10. The cause of insolvency was "Badness of trade and illness of wife and insufficiency of profits on business". It appeared that Gage survived these difficulties. During 1862 and into the 1870s there were a number of newspaper reports of Mr Gage decorating and enhancing various locations and events with his many splendid flags and banners. On 23rd August 1862 the Cambridge Chronicle recorded that prizes for a competition would be on display "in Mr Gage's window in Sidney Street". In May 1863 a thief was prosecuted for stealing a box of photographs from Mr Gage's shop window. In 1865 there was a sale of building materials from a house in Sidney Street "occupied by Mr E.Gage", and workmen were injured in dismantling the building. On 15th July 1865 the Cambridge Chronicle reported a case in the Cambridge Magistrates Court involving a licensee, Mr E Gage, allegedly assaulting PC Gault. Was this the same E.Gage then operating in the liquor business, or a totally different person? The PC's evidence was rebutted by evidence given by a Harry Field, Photographing Artist. The case against Mr E.Gage was dismissed. In 1868 E.Gage was the licensee of the Greyhound in St Andrews Street. References: Mike Petty, The Photographers, (a handlist of local photographers), Cambridge, Cambridgeshire Collection, 1992. Mike Petty, An Eye on the Past, Cambridge Weekly News, 4/11/1992. Cambridge Independent Press 28 September 1861. Cambridge Chronicle 15th July 1865. Subjects, styles, advertising, other relevant information: Three photography students from Nottingham Trent Polytechnic were reported in the Cambridge Evening News 30 Jan 1980 as starting their own Gallery, Gallery Soleil, in Free School Lane, Cambridge. The students had been working on building sites to get together their starting capital for the Gallery. The three partners were: David Rooke, Simon Heap and Rob Nichols. They all lived at 5a Castle Street, Cambridge. Subjects, styles, advertising, other relevant information: Booksellers, printers and publishers of The Isle of Ely and Wisbech Advertiser and Wisbech Telegraph - postcard producer with several series of cards, photographers not currently known.. Subjects, styles, advertising, other relevant information: In the 1911 Census these two brothers were both shown as resident at the above address. Christopher was a photographer - a worker employed by someone, married to Emily b: 1879 Oxford, with a 12 year old son Christopher b: Oxford. 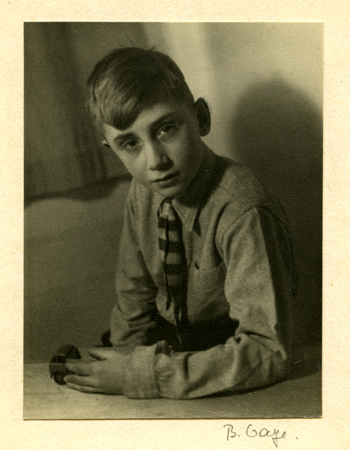 Living with the family was Christopher's younger brother Tom, who was shown as a photographer's apprentice. In the 1901 Census Christopher, his wife and child, were living at 31 Edith Road, Oxford. Christopher was a photographic printer, employed by others. In 1891 Christopher was living with his parents at 17 Worcester Place Oxford, He was then a photographer's apprentice. His father, Thomas John Gardiner b:1847 Oxford, was a photographer's assistant employed by others. Given the family background in Oxford, it is possible that the Gardiners were employed by Hills and Saunders and came to Cambridge when the firm re-opened after the bankruptcy of Robert Hills. In the 1939 Register Christopher H Gardiner b:1876 was shown as a photographer, a widower, living at 9 Bentinck Street Cambridge. He was a Special Constable with the Borough Police. Subjects, styles, advertising, other relevant information: Edward Garlick offered portraits and local views of churches, landscapes etc. In 1871 he was listed as a photographer at Short Street, Stretham, Cambs. In 1881 he was lodging at New Street Chatteris and working as a photographer. By 1891 he was working as a plumber, later as a grocer. In 1911 the family had settled in Friskney, Lincolnshire, where Edward was described as grocer and draper. 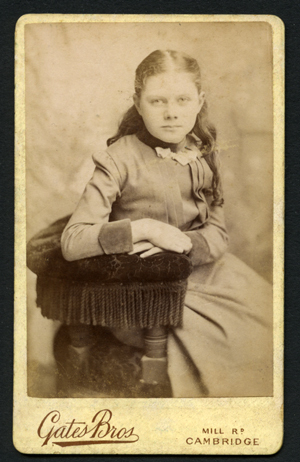 The first image below is an 1870s carte de visite of a young woman, on a square mount from Edward Garlick's Photographic Rooms - no address or town shown. Next is a carte de visite (author's collection) of an unknown group of nine girls take in a garden setting, by EA Garlick. Some of the girls are holding books, some flowers. 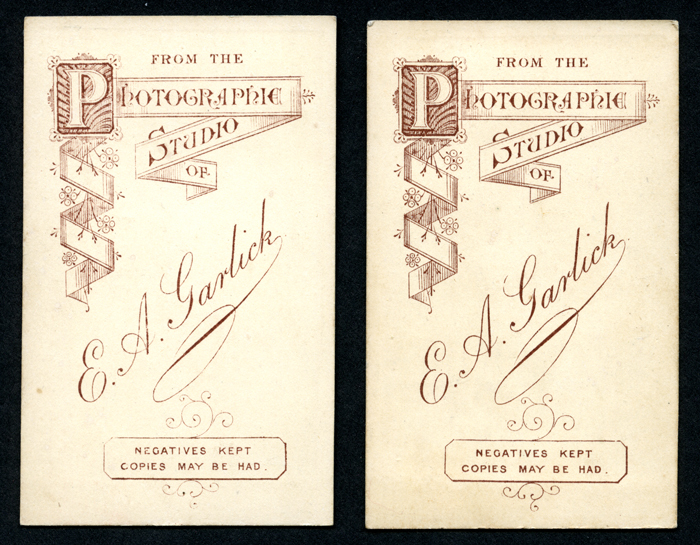 The mount has square corners and on the reverse states " From the photographic studio of E.A.Garlick. Negatives kept, copies may be had." 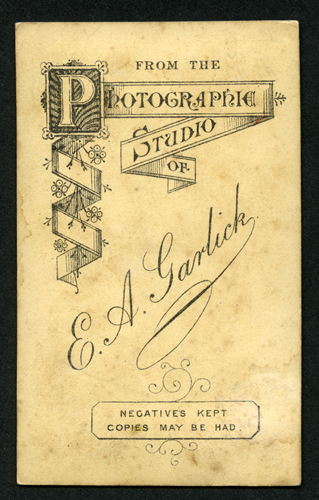 - no address is shown for Garlick's studio. Taken together, the lack of address, the clothing of the sitters, the mount, all suggest this is one of Garlick's earlier works. Below this are two other cartes de visite examples of his work, with similar reverse sides without an address. 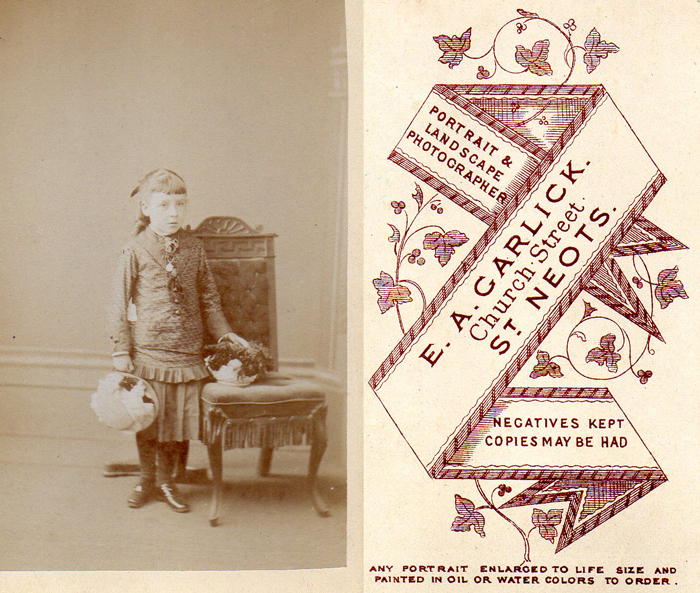 The next carte de visite of a standing girl has a more complex folded banner and ivy design on the reverse, with the address of Church Street St Neots, from the late 1870s / early 1880s. (Michael Brown Collection). Address: 44A Hills Road Cambridge 1961, 1 Jesus Lane, Cambridge 1965, 3 Jesus Lane from around 1968, 18A George IV St 1975, Hills Road Oct 1976. Subjects, styles, advertising, other relevant information: In the 1961 telephone directory, Louis Garnade is shown as living at London Road Sawston and having a photographic studio at 44A Hills Road Cambridge. In 1972 Garnade had a studio at 3 Jesus Lane Cambridge. By 1975 according to the local telephone directory, Louis Garnade had a studio at 18A George IV St Cambridge and was living at 18 Stansgate Ave, Cambridge. In the 1960s, University authorities strictly controlled the professional photographers who plied their trade outside the Senate House on Degree Days. Many graduates and members of their families, dressed in their finest outfits were willing to pay for photographs recording their special day. In the early 1960s photographers from Stearns and Edward Leigh attended these events but were not allowed to have any advertising or to take cash payments on University premises. Frank Bird recalls that Louis Garnade changed all that - he set up on the scene with a female cashier, till and advertising, after which University officials relaxed their grip in the face of a fait accompli. The Cambridge Evening News 22 Oct 1976 reported that Louis Garnade was having a great success selling poster sized colour prints of close-ups of peppers, tooth brushes and whisky bottles at £25 each. These were extras from a recent commercial commission they had handled. They were being sold from the firm's premises in Hills Road. Subjects, styles, advertising, other relevant information: Maria is listed in the 1911 Census as a "photographer's artist", working on her own account from her home at 6 Benson Street. She lived there with her husband, Garnet Gass b: 1880 Oxford who was shown as a printer's compositor, an employed worker. They had three children aged 7, 6 and 4 years. Address: 1 Fitzroy Street Cambridge according to Spaldings Directory 1895, 2 Fitzroy Street according to Gates photograph below and 26 Mill Road Cambridge. Subjects, styles, advertising, other relevant information: The 1891 Census shows Thomas Gates at 26 Mill Road Cambridge, listed as a photographer. By 1901 he was living and working as a photographer in Station Road, Sudbury, Suffolk. By 1911 Thomas was listed as running an eating house at Station Road, Sudbury, Suffolk. 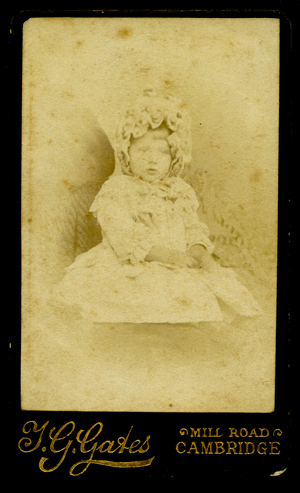 See below carte de visite, studio portrait of an unknown child by TG Gates, Mill Road Cambridge, mounted on black card with gilt lettering, reverse blank. 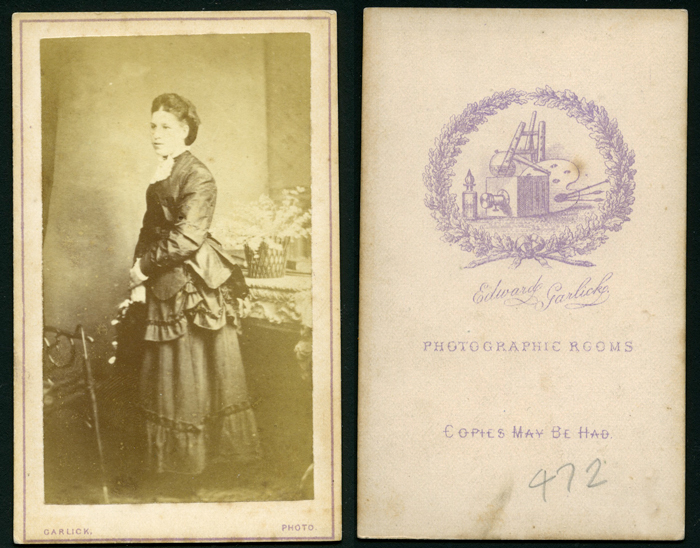 Beside this is a slightly later carte de visite of a seated unknown lady by Gates, with two addresses, 2 Fitzroy Street and Mill Road. This too is mounted on black card, rounded corners, silver edges and silver print. Reverse is blank. Subjects, styles, advertising, other relevant information: This is likely to have been a brief partnership between Thomas George Gates and Ralph Starr, captured in the 1889 trade entries of Spaldings Directory. If so, the address could have been 26 Mill Road, the premises occupied by Thomas George Gates in the 1891 census. Subjects, styles, advertising, other relevant information: Advertisement Cambridge Chronicle 9/7/1890. 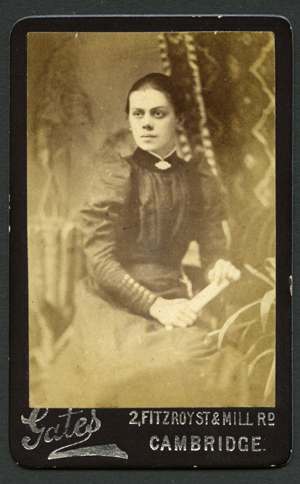 See below example (author's collection) carte de visite studio portrait of a young woman, mounted on cream card, on the face is printed "Gates Bros Mill Road Cambridge". 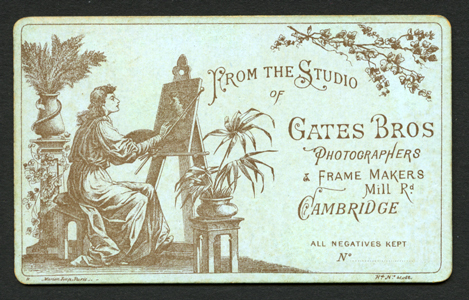 the reverse of the mount is a pictorial design of a seated woman artist stating "From the studio of Gates Bros Photographers and frame makers, Mill Road Cambridge, all negatives kept". The mount is by "Marion, Paris _._, Reg design 41.062. Probable date of design is c.1894. For more on Marion mounts see: www.cartes.freeuk.com/dated/marion.htm . To date no photographer brother to Thomas has been found in the 1891 census returns. Thomas can be found in Hornsey in the 1871 and 1881 census returns, but in neither case is there a brother with the family. Subjects, styles, advertising, other relevant information: In 1881 Harry was living at High Street Chesterton and was working as a gilder. In the 1888 Kelly's Directory he is listed as a photographer. In the 1891 census he was shown living in the same place and was employed as a photographer. At one point it is believed that Harry was briefly in partnership with John George SIMPSON (1854-1933) - the evidence for this being a surviving carte de visite bearing the name "Simpson and Gautrey". See our entry for Simpson and Gautrey. Address: 173 Burrowmoor Road, March, Cambridgeshire. Subjects, styles, advertising, other relevant information: In the 1939 Register Percy is listed at the above address as a photographic manager. At the same address was Ivy Gay b:1905 and Patricia A Gay b:1933, later Patricia A Hodson. Percy was a Special Constable. Subjects, styles, advertising, other relevant information: Remembered by photographer Frank Bird as a talented professional portrait photographer in Cambridge. Bertl was of Jewish descent, born in Vienna on 28th November 1901. Her maiden name was Bertl Sachsel. Bertl came to England during the 1930s. A number of her relatives died during the Holocaust in WW2. In 1938 she was listed in the London telephone directory at 52 Gordon Sq, London WC1. From 1941-46 she lived at 16 Kent Terrace, Park Rd London NW1. In 1943 Bertl Sachsel married Felix Gaye (b: 1905, Wetherby, d: 1987 Waveney Suffolk) who had trained as an engineer with Rolls Royce. From 1951-52 Bertl lived at Bye's Croft, Dunmow, Essex. Around 1958 Bertl was living at 48 Newbiggin Street, Thaxted, Essex. She moved to Cambridge in 1960. From 1960 - 71 Bertl lived at 35 Selwyn Gdns Cambridge and from 1974 - 84 she lived at 24 Trafalgar Rd, Cambridge. Bertyl described her early photographic career in an interview in the Cambridge Evening News, 21 August 1970. Bertyl was interviewed after some of her work was on view at the Cambridge Arts and Leisure Association's Exhibition at the Guildhall during the Cambridge Festival. She described her background and how she became interested in photography. "I went to an Art School in Vienna. I had always been a photographer without enthusiasm, taking jobs to live, until I had a strange experience. I had a Chinese map and one day I sat on the floor and had a cup of coffee. Suddenly I saw the shadow of the cup on that Chinese map. I saw the beauty of shadow and light and I went wild - I knew what beauty was in photography." According to the article, Mrs Gaye spent several years working in industrial photography in London, where she had her own studio. The family moved to Surrey before they found Thaxted. The article states that Mrs Gaye resolutely refused to use anything other than a basic Roleiflex camera. She said, "I change it every two yearsbecause it is used so much. I don't put any lenses on, not even a filter - nothing. I sometimes take, if it's very dark, an ordinary 250watt bulb which I plug into any lamp they have. But usually I don't use it." Some of her sitters were famous in the arts and academic worlds and some of her earlier surviving photos were taken in the 1930s. The National Portrait Gallery lists two of Bertl's portraits of Lady Strauss from the 1930s-40s. The Library of the RIBA has a photograph by Bertl Sachsel dated 1936 Reference RIBA71528, depicting the exterior of the S. Weiss Lingerie shop, Golders Green, London. The VADS catalogue lists a commercial portrait by Bertl used in an advertisement for Miners Liquid Lipstick which appeared in the Sunday Pictorial 14 April 1940. Bertl continued to use her maiden name in professional work after she married. The Welcome Institute has a portrait of Melanie Klein, by B Sachsel, 1944 (Library Reference Library reference: CMAC PP/KLE/A.95, Photo number: L0017906). 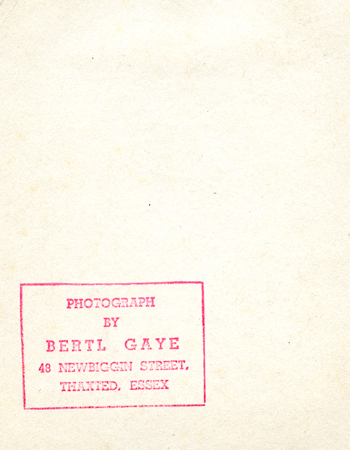 Bertl appears to have done freelance magazine work and one of her photographs survives in the East Sussex Record Office of a child drawing on blackboard, endorsed with a purple back-stamp in the name "B Sachsel photographer", also stamped 'Womans Journal'. This was used in an article in the Woman's Journal by Nesta Obermer, dated 1946 on 'The Heritage: where boys and girls can turn to a happy childhood and a busy future', East Sussex Record Office reference HB/130/37. (1793) and HB/131/106. 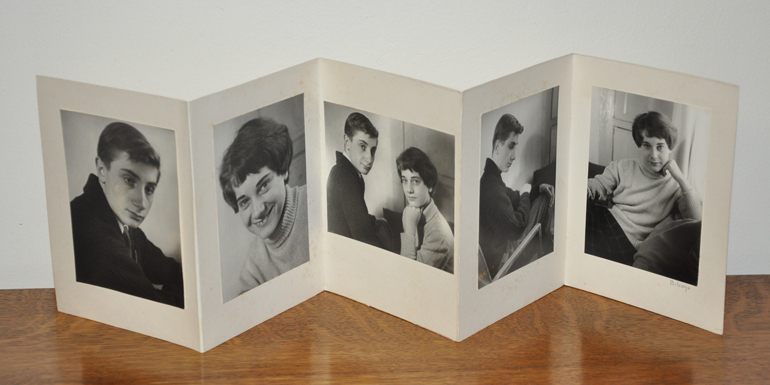 Below are example portraits by Bertl from the author's collection. The first is a portrait of a young boy, his hand resting on a toy truck, taken in natural light. 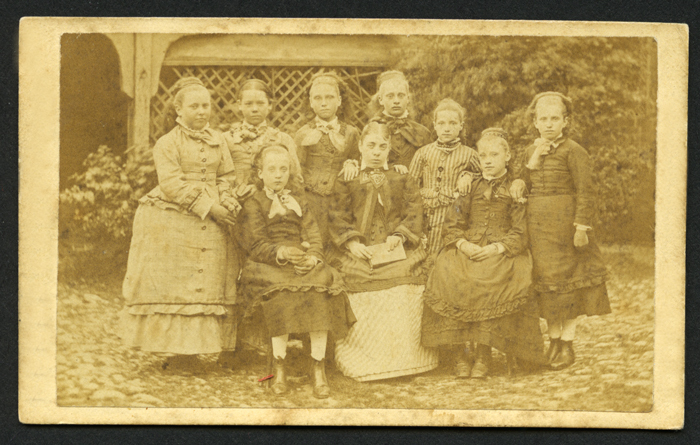 The photograph is 3.25 x 4.25 in, on a cream card mount 4.5 x 5.5 inches. There is a handwritten signature in pencil below the photograph and the reverse of the photograph and mount are backstamped in red with the photographer's name and address. 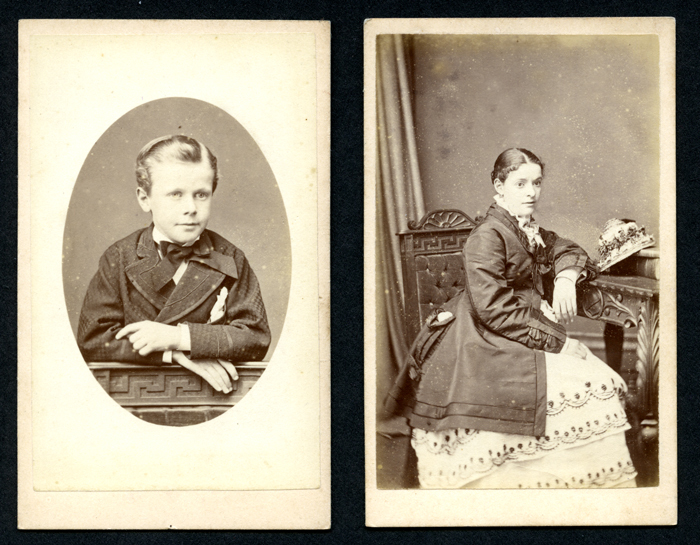 The second is a set of five portraits of two young people who may well be brother and sister. The images are taken in natural light and are each 4.25 x 3.25 inches, mounted on a concertina fold cream card mount. There is a signature beneath one image and a backstamp in blue in tiny print with the artist's name and telephone number. These are both examples of Bertl's work while she lived at Thaxted, around 1958 - 1960. One of Bertl's interests was described by local photographer Frank Bird as "a photographic study of human hands". He remembers she produced a series of photographs of the hands of violinist Yehudi Menuhin. Her portraits used natural lighting only. The 1952 publication "A Dunmow Diary 1951", written and published by Alexia Wilson, is illustrated with photographs by Bertl Gaye. There is a portrait by Bertl of Benjamin Britten in the National Portrait Gallery. Another of her portraits appears in the Cambridge University Publication "100 Years of Plant Sciences in Cambridge: 1904–2004". Kings College Library has three of her photographs of the author EM Forster dated around 1960 (Ref EMF/27/759-61). "The Baby" by Sheila Mason, published by Cambridge University Press in 1974 is illustrated by Bertl Gaye. The Britten Pears Foundation list in their catalogue a photograph by Bertl of Benjamin Britten's hands resting on an opened manuscript score, near the time of his death, Sep 1976. "Photography is not an art but a craft" contends photographer Mrs B Gaye of 35 Selwyn Gardens Cambridge, who currently has an exhibition in the Arts Theatre coffee bar of portraits and children's studies taken in natural surroundings. But she admitted that to be a good photographer one has to be able "to see"; in other words have the ability to judge what will make a good photograph. Mrs Gaye, who came to England in 1939 from her native Austria, moved to Cambridge this year from Thaxted as she felt the city would give her more opportunity as a photographer than the small Essex town. She likes photographing everything from "a Prime Minister down to a piece of cheese" and her one aim is "to make people look natural". She feels that people are less self-conscious in their own homes and the setting gives an indication of their character which Mrs Gaye finds useful in deciding on the right way to take the photographs. "Each person has hundreds of expressions and I am concerned with getting the one which is most characteristic," she added, saying that she likes, for this reason, to talk to her subjects for a time before attempting to photograph them. Mrs Gaye uses an old but good camera, tries to avoid working in artificial light and rarely uses studio lamps. Instead she tries to get photographs of people as they are and does not like them to dress up. "I least like photographing pretty people who have been photographed very often and know exactly what they want to look like." Mrs Gaye added with a smile that she usually takes the photographs they want and asks if she may take some for herself. "And they usually choose the second batch!" She loves children and always enjoys photographing them as is obvious from some of the delightful studies on show in the exhibition. Mrs Gaye would appear to have contradicted her earlier statement about photography not being an art. Her photographs have life, originality and that animated natural quality so often lacking in planned studies. This is evidence of the value of photography as an art form. Mrs Gaye does all her own developing and enlarging and never ceases to be excited and to wonder if the photographs will be as she saw them at the time of taking. In her spare time Mrs Gaye, who has a teenage son, like reading and painting. She has an intense interest in people with an insatiable curiosity about what they do and who they are. Yet although she spends the larger part of her life photographing other people she has no photograph of herself. She dislikes facing a camera. It is believed that Bertyl got work mainly through personal recommendations from clients. In the 1970 interview quoted above, Bertyl said "How I get work I really don't know. I don't advertise . I don't have any social life: I don't go to cocktail parties to get known"
References: This Australian reference relates to a portrait of Professor Gilbert Murray by Bertl Sachsel - it is signed in pencil "B.Sachsel" in the lower RH corner of the mount. Personal recollections of Frank Bird. Biographical research kindly conducted by Dr L Culank. Kelly's Cambridge Directories of 1968 and 1968 record Bertl as a resident at 35 Selwyn Gardens Cambridge, but she has no listing in the commercial pages. In her autobiography, US author and human rights campaigner Jeanne Wakatsuki Houston (1934–), recounts her stay in Thaxted England 1958-60 and gives a detailed description of meeting Bertl when Bertl used a garden shed in the Houston's back Yard as her darkroom/studio. There is also an account of their subsequent friendship and later meetings in Cambridge. Jeanne Wakatsuki Houston (1934–) Biography - Autobiography Featurejeanne Wakatsuki Houston . Bertl's son Adrian Lawrence Gaye 1944-2010 was a film producer working in the UK.